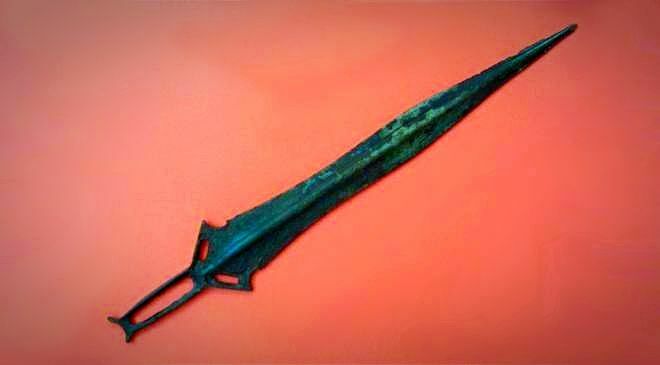 The typology of the examples found at the Puertollano site to which this item belongs, and their parallels on the Pensinsula, suggest the existence of a local workshop.This sword is part of a deposit dating from the late Atlantic Bronze Age (950 B.C.) and found on the estate known as the “Camino de Santiago” in Puertollano (Ciudad Real). This deposit is exceptionally valuable due to the small size of the swords. These pieces were withdrawn from circulation and intentionally buried at a time when metal was not within reach of everyone, and its possession was seen as a symbol of economic and social power.